Orders must be placed Nov 10 between 12:01 am to midnight PST. Double Line Add: Regular Price $1.75 Sale $1.65. Triple line Add - Regular Price $2.75 Sale $2.50. 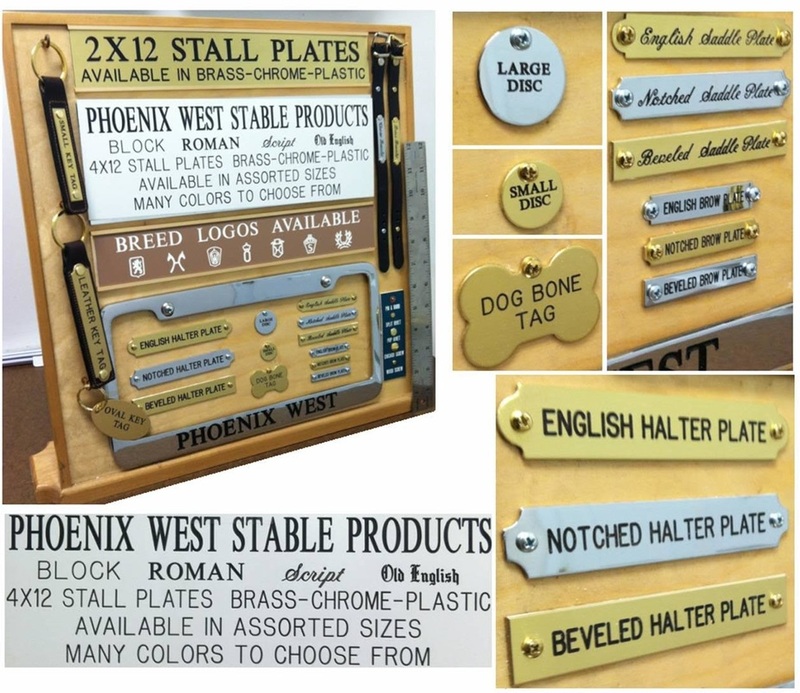 Dog Bone 1 1/8" x 1 3/4"
Brow Plates 3/8" x 2"
Saddle Plates 1/2" x 3"
Halter Plates 3/4" x 4 1/8"
Fasteners: Please specify Halter Nail, Halter Nail w/Washer, Split Rivet, Pop Rivet 1/4", Pop Rivet 1/2", Saddle Plate Nails, Wood Screws. Chicago Screws (Add $0.72 each). 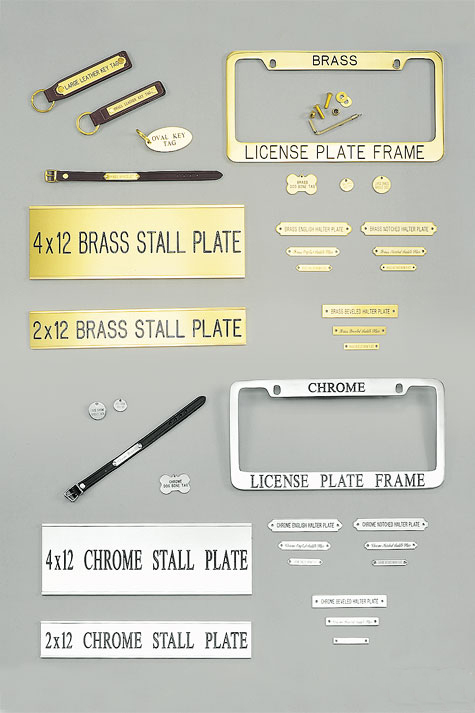 Oval Key Tag 1 1/8" x 2 5/8"
Small Key Tag with Saddle Plates 7/8" x 4 1/2"
Large Key Tag with Halter Plates 1" x 5 1/8"
Brass or Chrome Engraved in Roman or Block. Double Line add $1.00 to Single line price! Buckle Bracelet Black or Brown w/ Brass or Chrome 1/2" x 9 1/2"
PRICES LISTED ARE CHRISTMAS SALE PRICE!! 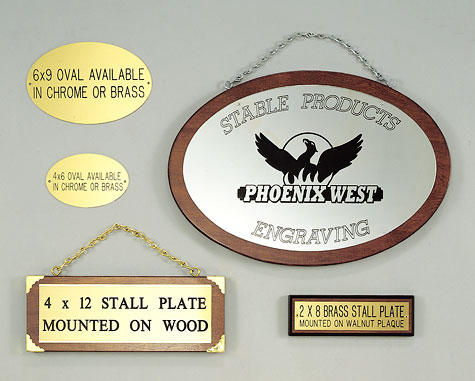 These can be mounted on stained or painted wood to match your stable colors. Custom layout in different sizes to suit your needs no set up fee. Choose from 4 colors. 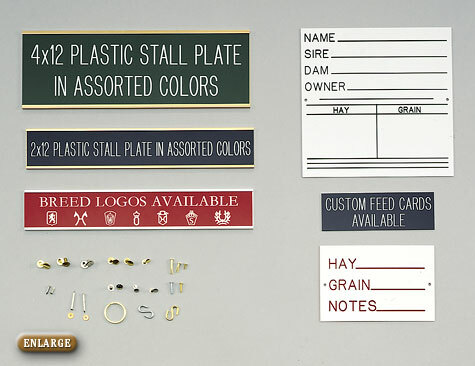 Feed cards have a white writing surface with Black, Red, Green and Blue printing. Breed logos also available.